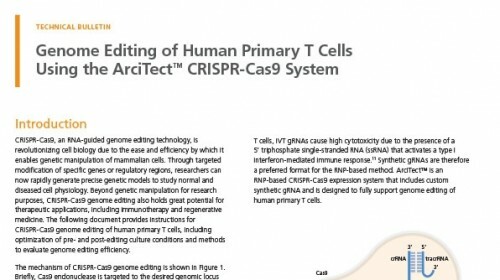 ArciTect™ T7 Endonuclease I is the preferred enzyme for detecting genome editing such as insertions or deletions (INDELs) generated by CRISPR-Cas9. 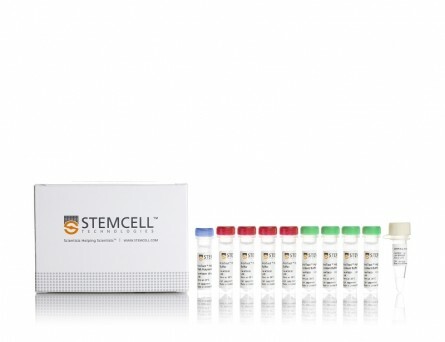 ArciTect™ T7 Endonuclease I Kit is comprised of ArciTect™ T7 Endonuclease I and ArciTect™ T7 Endonuclease I Buffer (10X), which have been tested and validated for use with the ArciTect™ CRISPR-Cas9 genome editing system. 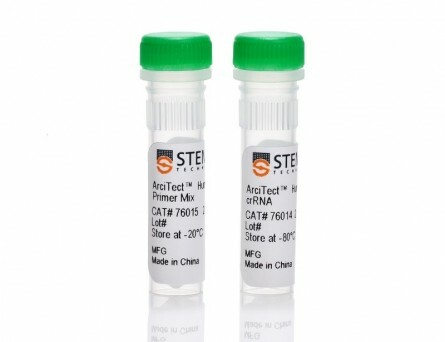 ArciTect™ T7 Endonuclease I recognizes and cleaves mismatched DNA, cruciform DNA structures, Holliday structures or junctions, heteroduplex DNA, and, less efficiently, nicked double-stranded DNA. 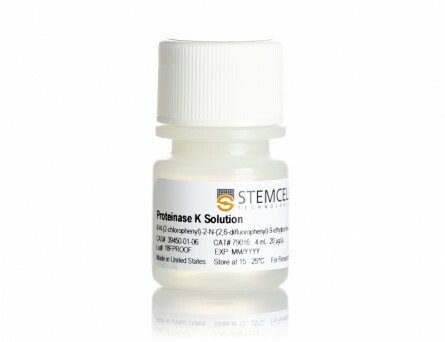 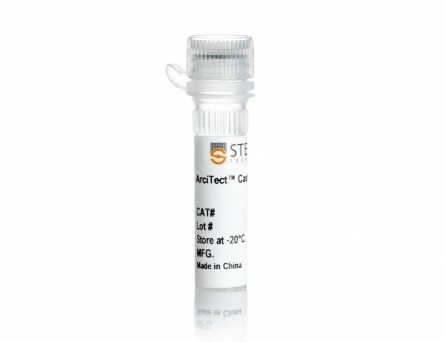 Since the cleavage efficiency is proportional to the number of INDELs created at a specific DNA target, ArciTect™ T7 Endonuclease I Kit is used to estimate gene-editing efficiency in a rapid and cost-effective manner. 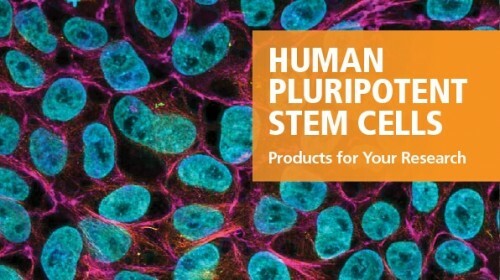 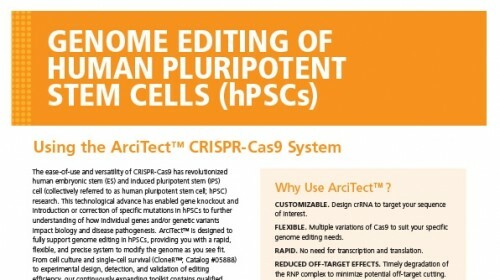 Human embryonic stem (ES) and induced pluripotent stem (iPS) cells (A) and T cells (B) were edited using ArciTect™ Cas9 Nuclease (Catalog #76002) and ArciTect™ Human HPRT Positive Control Kit (Catalog #76013), and INDEL formation was assessed using ArciTect™ T7 Endonuclease I Kit. 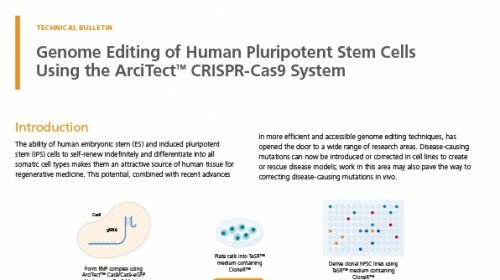 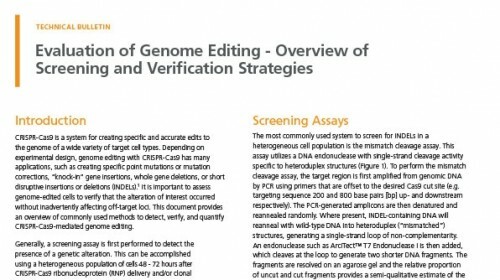 Following CRISPR-mediated editing at the HPRT locus, genomic DNA was isolated and a 1 kb region surrounding the target site was amplified by PCR using ArciTect™ Human HPRT Primer Mix (included with Catalog #76013). PCR products were purified, then denatured, re annealed, and cut with ArciTect™ T7 Endonuclease I. 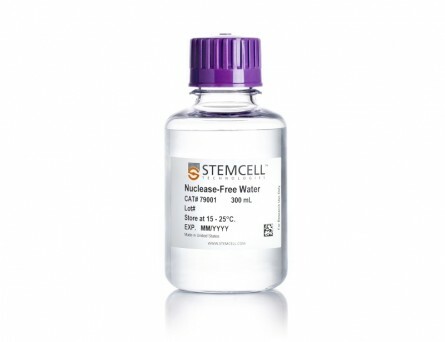 Samples were resolved on a 1% agarose gel, and band intensities were determined using a ChemiDoc™ MP Imaging System (Bio-Rad). 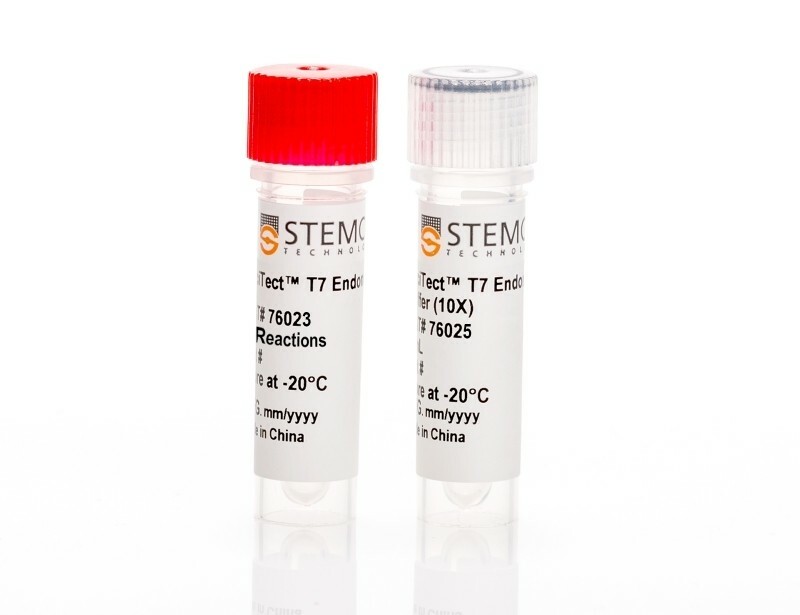 Relative intensities of the full length (1083 base pairs [bp]) and T7 cleavage product bands (827 and 256 bp) were used to calculate the cleavage efficiency (%). 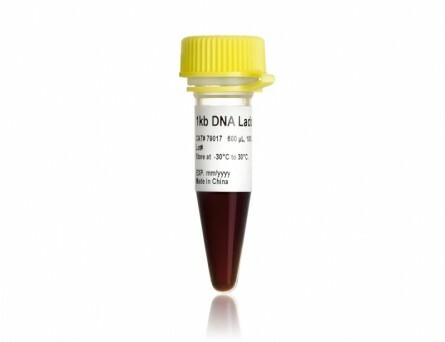 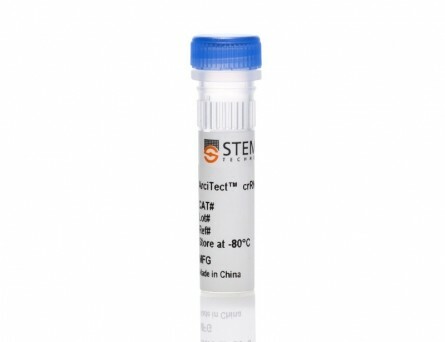 Control: Uncut PCR product (no T7 added); Test, Donor 1, and Donor 2: T7-digested PCR product. 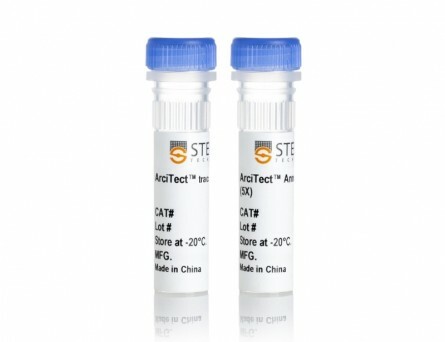 The purchase of the ArciTect™ products conveys to the purchaser the limited, non-transferable right to use, in accordance with applicable laws and regulations, such purchased products and any related material solely for research purposes only, not for any commercial purposes, with no warranty from the owner or assignee of the Patents, and with no liability to the owner or assignee of the Patents, or a director, trustee, officer, employee, agent, faculty, official investigator or student thereof. 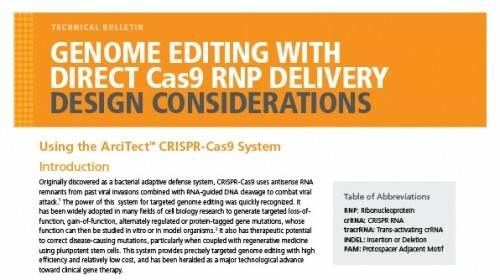 Distribution of ArciTect™ products is covered under at least US 8,697,359, US 8,771,945, US 8,795,965, US 8,865,406, US 8,871,445, US 8,889,356, US 8,889,418, US 8,895,308, US 8,906,616 and foreign equivalents (“Patents”).